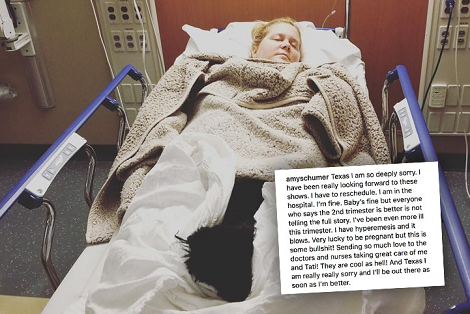 Amy Schumer has been hospitalized with some pregnancy complications and, as a result, has had to cancel an upcoming comedy gig. Sources close to the comedian say she was taken to a Texas hospital Thursday for nausea, a common issue during the second trimester of a pregnancy. It was in late October she announced she and husband Chris Fischer were expecting their first child together.